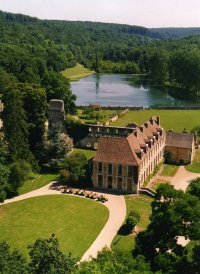 Settled in the beech of the heart of Lyons forest, its ruins still lie in a bucolic setting that invites an almost mystical walk as these places are full of History. Built in 1134 from a request of Henry the first Beauclerc, first Duke of Normandy, King of England and fourth son of William the Conqueror, it takes its name from the Latin "Mortum-mare" which means "Dead-Sea" because the vast swamp that flooded the region at this area. Since its foundation in the 12th century, the Abbey is shared between several worlds. The water, of course, the earth from which it draws its substance, the forest that reveals its splendor, and finally the sky, to which it is dedicated. The location was chosen for its calm, conducive to peace and prayer. Affiliated to the Cistercian order (it was the first time in Normandy), she lived in complete autarky thanks to the pigeons from the dovecote, lamprey, perch and tench fish ponds, wine and honey produced by friars. Its influence and its role in the region is undeniable. From the church of the 12th century, it remains today only a few sections: the support of the north transept and its rose, the pantry and a piece of yard. In the 18th century, the Abbey suffered a mind and soul languor that made it gradually lose its substance and its mainspring. In 1790, it remained only five friars. During the French Revolution, the last four monks were hunted down and killed in the cellar. 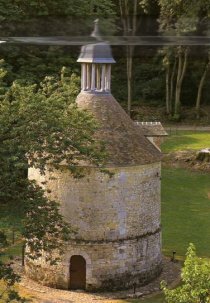 Leaving the museum, do not forget to admire the 18th century dovecote with a noticeable chestnut wood structural. It used to feed the many visitors who were formerly received in Mortemer. Abbot led the Abbey but was also justice of the peace. He administered justice for petty theft. Accordingly, he had the strip justice which is still visible nowadays (protruding stones and making the rounds of the pigeonhole). Once the award was made, the prisoner was locked inside to serve his sentence there. In the bottom of the park, finish your tour strolling along ponds where many birds breed freely, unless you prefer to enjoy the rustic little train that runs along the lake. So imagine, in the heart of the forest of Lyons, far from any dwelling, nestled in a valley through which flows the source Fouillebroc, the ruins of an Abbey ... Mortemer, kingdom of God on earth, but also kingdom of Satan if we believe the many legends about it.